We have marketplaces for virtually everything nowadays. For micro-components. For practicing Japanese. For finding love. We have marketplaces because they work. They’re efficient. Isn’t it about time we had a marketplace to match the urgent needs of people torn from their homes by war, by floods, by famine with the millions of us who want to help, but don’t know how? Social startup NeedsList, one of the many to emerge from the Techfugees Network in 2015, was born out of a desire to create efficiency in humanitarian aid. Founder Natasha Freidus was supporting refugees directly near her home in Béziers, France, when she was struck by the lack of online needs management tools. One family needed a fridge, another needed diapers, another little boy had no sandals. The group needed a website, translators, and food deliveries. The needs changed week to week, day to day. Meanwhile, people wanted to help, they just didn’t know how. Natasha searched for online “needs management” tools to communicate with donors, but found nothing and ended up hacking a wedding registry just to have a way to show needs in real time. This experience was the impetus behind NeedsList – a “registry model” of aid connecting individual and corporate donors with urgent local needs from refugees. Since their launch in 2017, donors on the platform have already met over 28,000 needs for displaced people in 10 countries representing a value of almost $100,000 in supplies and donations. 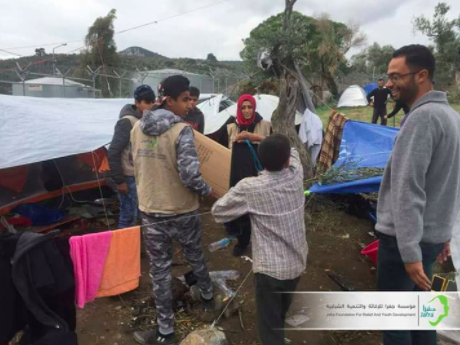 The Jafra Foundation distributes sleeping bags purchased by global donors from a Greek supplier in the Moria Camp on Lesvos. The tech behind the scenes. The tech model is simple, like a wedding registry or Amazon wishlist, NGOS create a list of supply, volunteer, or funding needs. NGOs can then share their lists with their donor base and/or embed lists on their websites. General users can come to the website and search the database of needs by type, geography, even ways to meet needs that will be tax deductible or eligible for gift aid in a specific county. The company partners with local suppliers – so donors can actually purchase real, not symbolic, supply goods. Partnering with local suppliers means that needs get met quickly with minimal carbon footprint. Moving forward, NeedsList will be testing out other tech solutions to streamline the process including a chatbot so NGOs can easily text in needs from the field, a payment solution that will operate similar to cashcards for NGOs, and is exploring blockchain to secure transparency across the supply chain. This holiday season, like any good holiday season, was a bit magical for the company. The founders wanted to launch a workplace giving program, in the form of holiday “NeedsLists”. The challenge? As any tech startup knows, corporate sales cycles are slow. While founder Natasha was able to set up meetings with leadership at Fortune 500 companies, she doubted commitments would come in before the end of the year. Meanwhile, winter was quickly approaching, refugees throughout Europe were literally out in the cold, and the season for giving was coming to a rapid end. So the team at NeedsList shifted tactics, reaching out to startups, figuring that smaller companies could make a decision quickly. Sure enough, later that week, within a few hours of pitching Norwegian company Xeneta, the deal was closed. Xeneta CMO Katherine Barrios explained that they were drawn both to the cause AND to supporting another startup. She presented the initiative at the company holiday party and wrote, “We saw positive headshakes and smiles. We are able to help those much more in need than us, empower employees to care about social responsibility, and help a fellow startup.” Xeneta is distributing gift cards to every employee to purchase urgently needed winterization supplies for A Drop in the Ocean’s NeedsList, a Norwegian NGO supporting refugees in Greece. 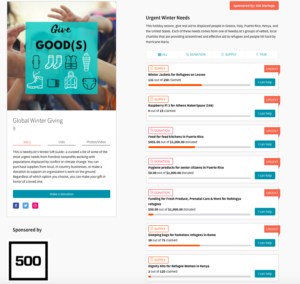 A few weeks later, 500 Startups followed suit, sponsoring a Winter Giving list. Like Xeneta, the company was attracted to NeedsList not only by the innovative model, but also the global scope of the needs. Now additional companies are creating NeedsLists – driven by a dual mission of giving back and supporting innovation. With the numbers of people displaced by war and natural disaster expected to quadruple by 2050, we know it will be all hands on deck when it comes to meeting needs – individuals, governments, but also the private sector. Want to get started? Get in touch! If you are an individual simply to go needslist.co and see what need you can meet. If you are a business consider partnering with NeedsList as an enterprise user. You can sponsor specific needs and have employees to engage with time or funds. Or, if you supply items frequently requested by refugees, talk to us about becoming a supplier. If you are an NGO providing services to refugees, and want to take NeedsList for a test spin, let us know! It’s time to give in a way that allows choice, supports local economies, and fosters bottoms up innovation.